Saturday 10th September will be my first and only trip to the Strathclyde Homes Stadium. 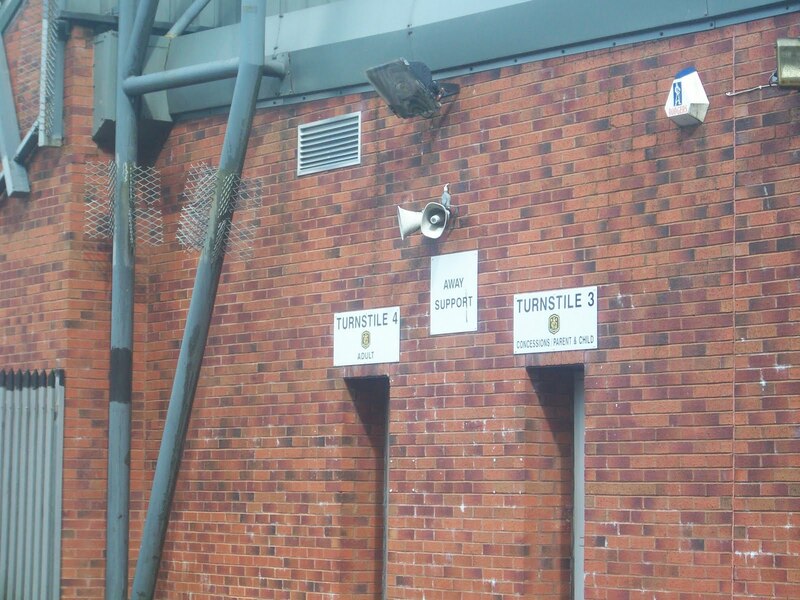 Not because it wasn’t good fun, but because the company – Strathclyde Homes Ltd – have been placed into receivership and so the club is now actively seeking organisations who may wish to register an interest in the stadium naming rights! I personally like the idea of either the “Cadbury’s Chocolate Button’s Stadium” or “Heinz Beans & Sausages Stadium”. I have yet to submit these ideas. One thing I will say for the stadium though – what a hugely impressive backdrop. It sits under the Castle Rock which dominates the local skyline…..The Rock? Perhaps the “Alcatraz Stadium”? 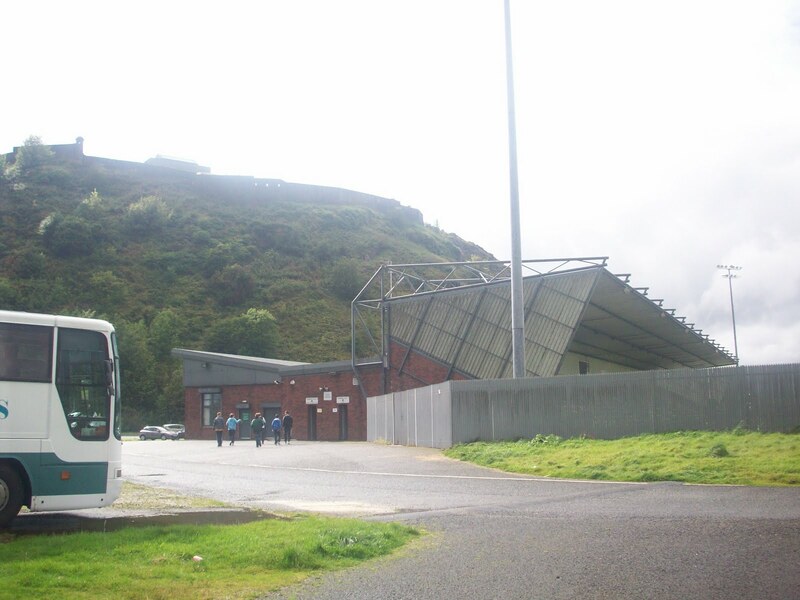 The ground consists of only one stand which is nice, modern and comfortable (pictured below underneath the Rock & courtesy of the fine people at Scottish Football Grounds) with home fan entry on the East and Central parts of the stand and away fan entry at the West end. 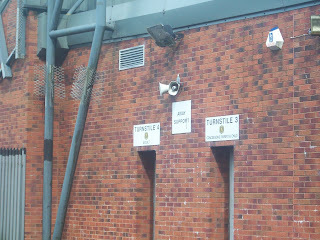 Entering the ground at the home end, east side, I was immediately confused and wondered if I’d maybe entered a portal to somewhere entirely different. In front of me sat about a half dozen tables, set up cabaret style (though no sign of Catherine Zeta Jones) with every second table packed full of condiments. The other tables were taken up by locals reading newspapers, drinking tea and generally chatting away. Quite a nice sight if not a bit unnerving and inexplicable. 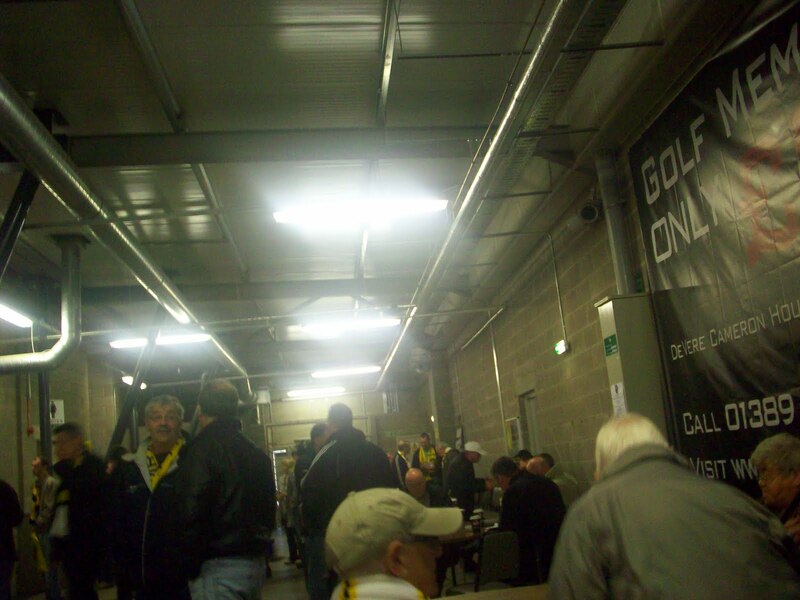 I also noticed a mystery grey door which I discovered played host to a bar and the club shop. Quite impressive and high on the quirk-factor. Before getting myself scranned up, I had a peek at the rest of the ground – which consists of a 6 foot metal fence all the way round the other three sides. I should have kept a tally of the number of times a ball was lost! Opting for the standard cup of tea and a pie – coming in at £2.65 – I was reasonably pleased with what was on offer. The girls behind the counter were lovely and friendly, they managed to batter through a fairly sizeable queue quite quickly and in the end….it didn’t taste to shabbily either. Not much else to say on this front really! There is actually a little bit more to say and, without being too cruel, I do suspect that the Dumbarton mascot is a huge fan of the local catering. Pictured below (the one on the left) this fella really was one of the least enthusiastic mascots I’ve seen at a ground in all my years of going to football! 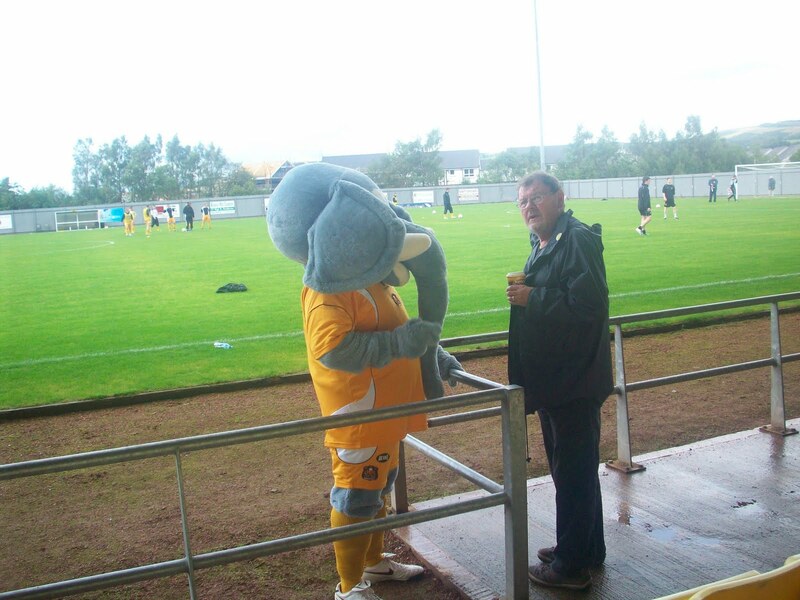 This cuddly chap (definitely the dude, not just the elephant costume) wandered up and down the touchline…maybe twice…before kick off…stopping to chat only to the guy in the below picture and otherwise doing absolutely bugger all! For some reason, I found this even more amusing than if he’d actually put on some Sammy the Tammy style entertainment! 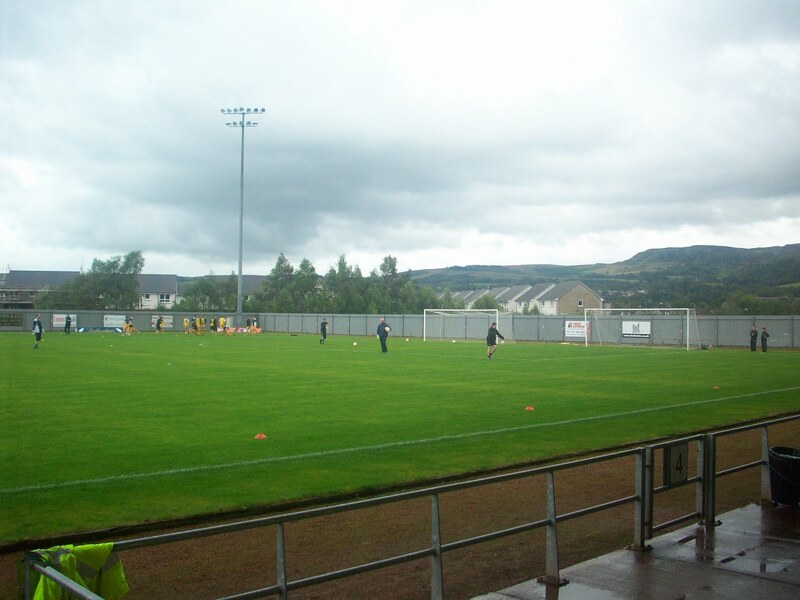 Anyway, tubby mascot aside, I was really impressed by the Dumbarton fans. I sat in front of a group of people – of all ages from a man in his 80s to a teenager – who all seemed to be genuinely pleased to hang out with each other. In front of me were a group of “likely lads” who were pretty entertaining. Aside from their stories of what they’d got up to with the “burrds” the night before, it turned out they knew one of the players, Kevin Nicoll – who I found out was nicknamed “Shagger”. That and “50p heid” due to his tendency to send headers unpredictably in all directions! The atmosphere I’d say, was similar to that of Alloa – not particularly raucous, but good spirited and respectful. Two of Arbroath’s goals were truly magnificent and were met with a round of applause and praise from the home fans - which is always a nice touch – but in no way did it detracted from the passion with which they support their team. The first half in particular was absolutely tremendous with Dumbarton going ahead on three different occasions, with two very well worked goals from Bryan Prunty and Mark Gilhaney, as well as a bullet header from Shagger himself! Credit to Arbroath, who played their part with three well worked strikes and one pretty soft (and ultimately winning) penalty. 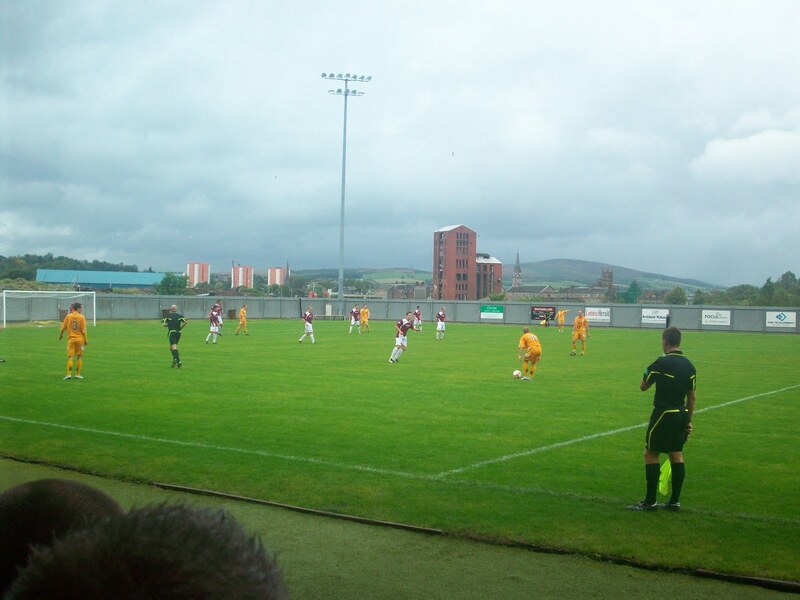 The second half was poorer from the home side – a mix of them losing their way and the Lichties stepping up their game somewhat. Firstly Mark Gilhaney, who took his goal very well, was generally pretty composed on the ball and has a good bit of skill and trickery about him. He played wide left on this occasion but looks like the sort that could comfortably play a free role. Difficult to play against I’d say. Next up is Scott Agnew. The former Stranraer man played centre midfield for Dumbarton and was a real creative force. A diminutive type, but with a pearler of a left foot a good range of passing and a decent strike on him. Think he’ll do well for Dumbarton. ….and last but not least, I suppose I have to mention Kevin “Shagger” Nicoll himself and despite his mates’ stick, he was a powerful and dominant force both in the air and on the deck for the Sons - especially in the first half. More often than not it was him winning the ball back and putting in a meaty challenge. Very decent on the ball too though, with good close control and range of passing. The first half alone paid my £12 entrance fee and then some. 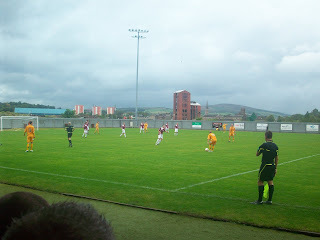 Dumbarton proved to be very good value for money as a day out. Factoring everything in, Dumbarton deservedly score highly. Their fans were top notch, the catering did the job and the stadium was both a bit quirky and very comfortable. Even in terms of entertainment, I was delighted with the day. The only let down was the second half which was a bit of a damp squib by comparison with the first and because of that, Dumbarton, while scoring highly, haven’t quite managed to pip Alloa to it! 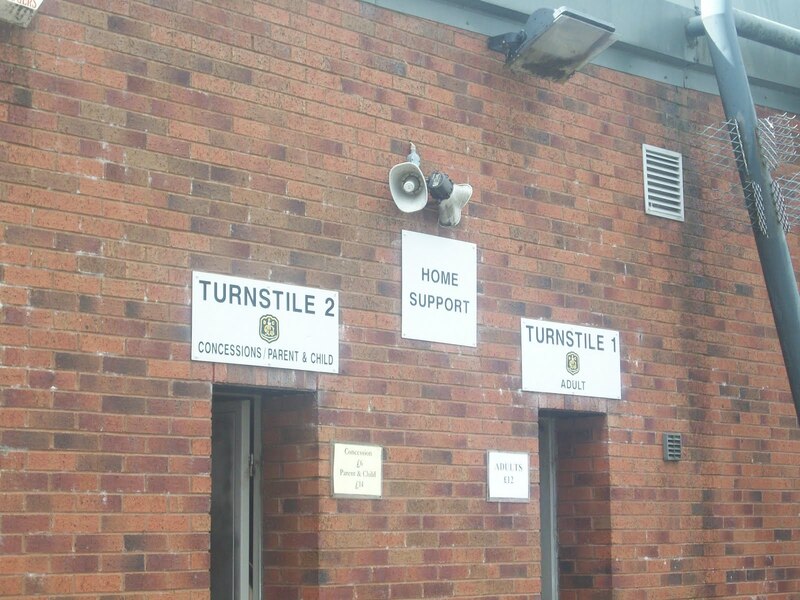 Fantastic supporter’s experience though and highly recommended to all! 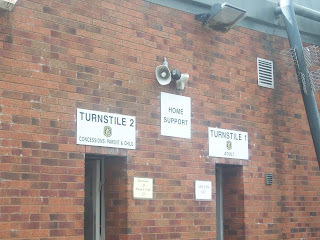 The condiment corridor and mystery door also left me baffled when I went to this fixture on Jan 2nd!